The cold winter season has already begun rolling in. As we get further into the winter season, temperatures will continue to drop and the need for heat and warmth in the home will certainly be a necessity. 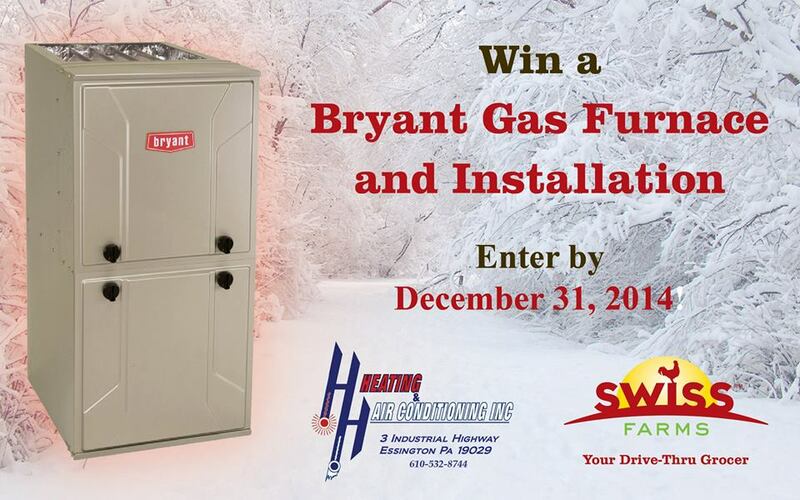 Because not everyone has the luxury of replacing their heating system, especially at this time of year, Swiss Farms and H&H Heating and Air Conditioning are generously teaming up this holiday season to give away a new Bryant gas warm air furnace and installation, valued at $3,500, to one deserving local Pennsylvania family. How wonderful is this? Do you know of a deserving person or family who could truly benefit from this incredible giveaway? If so, don’t delay! Head over to the Swiss Farms Facebook page for full contest rules and entry instructions. Full contest rules are also available on Swiss Farms’ website. Please note that all contestants must reside within Delaware or Chester County and must write a brief statement explaining why they or someone they know should be selected. A winner will be drawn at random from all eligible entries. Entries for this contest are being accepted exclusively through Facebook through December 31, 2014. H&H Heating and Air Conditioning will schedule installation of the new furnace by January 15, 2015. When looking for a retailer to partner with, Joseph Hoke, a partner for H&H Heating and Air Conditioning, immediately thought of Swiss Farms. “We share the same values. We both respect our customers’ time and struggles, whether they need groceries before a snowstorm or whether your heater stops running during it.” Both companies are based in Delaware County and serve the same customer base. H&H Heating and Air Conditioning was founded in 1985 on the principle building customer trust by providing reliable service. Their experienced and highly trained engineers and technicians design and install all types of heating and air conditioning systems for residential, commercial and industrial customers throughout the Philadelphia area. Swiss Farms has offered premium milk and groceries to southeast Pennsylvania through its unique drive-thru service model for the past 46 years. Unlike at other grocers, customers need only drive up to the door and place their order with a Swiss Farms Associate, who will gather the order and check it for quality and freshness. Two wonderful local companies giving back this holiday season. This makes my heart smile. God Bless their beautiful hearts and the deserving person or family who wins! Good Luck! Well darn…..great contest! Our furnance is limping and we are in Iowa. A bit far away :/ I would love to have a new furnace! Fabulous prize! NYC can get really cold in the winter. This furnace would really come in handy. This is an amazing prize. The companies running the giveaway have golden hearts and I love that they are giving back by offering such a generous giveaway for our local families here in Delaware County and Chester County PA. I love seeing companies give back to the community!